Cadmium is a transition metal used in batteries and pigments. 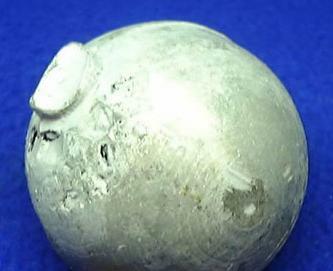 It is an impurity of zinc, and is isolated during that element's production. Recycling: Cadmium is mainly recovered from spent consumer and industrial NiCd batteries. Other waste and scrap from which cadmium can be recovered includes copper-cadmium alloy scrap, some complex nonferrous alloy scrap, and cadmium-containing dust from electric arc furnaces (EAF). The amount of cadmium recycled was not disclosed. Import Sources (2006–09): Metal:5 Mexico, 32%; Australia, 25%; Canada, 18%; Peru, 7%; and other, 18%. Events, Trends, and Issues: Global refinery production of cadmium was estimated to increase in 2010 as a result of production increases at zinc smelters that also recovered byproduct cadmium. Domestic apparent consumption of cadmium recovered in 2010 from its relatively low level in 2009; apparent consumption of cadmium declined dramatically in 2009 from that of 2008 as the recession in the United States deepened. The increase in domestic consumption in 2010 may have been affected by the economic stimulus package, which allocated approximately $2 billion for advanced battery manufacturing. Global consumption of refined cadmium was expected to increase as the market for NiCd-containing portable electronics rises. Most of the world’s primary cadmium metal was produced in Asia and the Pacific—specifically China, Japan, and the Republic of Korea—followed by North America, Central Europe and Eurasia, and Western Europe. Secondary cadmium production takes place mainly at NiCd battery recycling facilities. Cadmium use in batteries accounted for the majority of global consumption. The remainder was distributed as follows, in order of descending consumption: pigments, coatings and plating, stabilizers for plastics, nonferrous alloys, and other specialized uses (including photovoltaic devices). The percentage of cadmium consumed globally for NiCd battery production has been increasing, while the percentages for the other traditional end uses of cadmium—specifically coatings, pigments, and stabilizers—have gradually decreased, owing to environmental and health concerns. A large percentage of the global NiCd battery market was concentrated in Asia. NiCd battery use in consumer electronics was thought to be declining owing partly to the preference for other rechargeable battery chemistries—particularly lithium ion (Li-ion) batteries, which have already replaced NiCd batteries to a large degree in laptops and cell phones. Li-ion batteries are used in lightweight electronic devices because of their greater energy density (power-to-weight ratio). However, demand for cadmium may increase owing to several new market opportunities for NiCd batteries, particularly in industrial applications. Industrial-sized NiCd batteries could also be used to store energy produced by certain on-grid photovoltaic systems. Peak energy produced during the midday would be stored in a NiCd battery and later released during periods of high electricity demand. Concern over cadmium’s toxicity has spurred various recent legislative efforts, especially in the European Union, to restrict the use of cadmium in most of its end-use applications. The final effect of this legislation on global cadmium consumption has yet to be seen. If recent legislation involving cadmium dramatically reduces long-term demand, a situation could arise, such as has been recently seen with mercury, where an accumulating oversupply of byproduct cadmium will need to be permanently stockpiled. World Resources: Cadmium is generally recovered as a byproduct from zinc concentrates. Zinc-to-cadmium ratios in typical zinc ores range from 200:1 to 400:1. Sphalerite (ZnS), the most economically significant zinc mineral, commonly contains minor amounts of other elements; cadmium, which shares certain similar chemical properties with zinc, will often substitute for zinc in the sphalerite crystal lattice. The cadmium mineral greenockite (CdS) is frequently associated with weathered sphalerite and wurtzite but usually at microscopic levels. Zinc-bearing coals of the Central United States and Carboniferous age coals of other countries also contain large subeconomic resources of cadmium. Substitutes: Lithium-ion and nickel-metal hydride batteries are replacing NiCd batteries in some applications. However, the higher cost of these substitutes restricts their use in less-expensive products. Except where the surface characteristics of a coating are critical (e.g., fasteners for aircraft), coatings of zinc or vapor-deposited aluminum can be substituted for cadmium in many plating applications. Cerium sulfide is used as a replacement for cadmium pigments, mostly in plastics. Barium/zinc or calcium/zinc stabilizers can replace barium/cadmium stabilizers in flexible polyvinylchloride applications. eEstimated. Teck Cominco (NYSE: TCK) - Their specialty metals division produces cadmium, bismuth, germanium, and indium. American Elements - http://www.americanelements.com/cd.html - Cadmium metal, cadmium acetate, cadmium bromide, cadmium chloride, cadmium fluoride, cadmium iodide, cadmium nitrate, cadmium oxide, cadmium sulfate, and cadmium telluride.